Most of the house-owners who were recorded in the first tax list of Kuhmo in 1605 came from the region of Savo. The population growth was slow at first; the years of crop failure and diseases in the latter part of the 1600s and wars such as the Greater Wrath in the 1720s reduced the number of inhabitants. It was not until the late 1700s that the population numbers started to grow significantly. People had to move elsewhere in search of a livelihood; they went to Russia or moved west along the waterways. Initially, most houses were located along waterways and the inhabitants got their bread from slash-and-burn land but then the population numbers grew and people started to settle on the wooded hills. On the hills the crops were protected from the frost and the settlers could see the smoke from the campfires of foes approaching them. Many hilltops were former slash-and-burn land, so the settlers started to clear fields in the same spots. The habitation was unstable at first. A disease may have killed all the inhabitants of a house, where after new inhabitants moved into the dwelling place that had become empty. Another dwelling place may have turned poor and the inhabitants moved elsewhere. The empty house may have been re-inhabited later. Settlers started from very small things: "when the Old Man came to Levävaara, he slung his knapsack on the fork of a spruce and started hoeing" (extract from the interview of Heikki Kinnunen, the last master of Levävaara farm). The first buildings at Levävaara were very modest. People lived in a sauna-like building and a small cowshed was built for the cattle. It was still common to live in smoke cottages in the mid-1800s. It was possible to buy a new dwelling place, a farm, from the State. Tenant farmers were only allowed to live on the farm they had hired and cultivate the land. There were tenant farms on the lands owned by independent farms - i.e., a tenant farmer hired a farm and was only allowed to live there and cultivate the land without right of ownership. Crown tenant farms were also established on more remote State lands. In many cases, the inhabitants had lived on their farms for years before making a tenant farm contract. That was possible in remote areas where the worldly power was far away. The lands of the Crown tenant farms were owned by the State but the tenant farmer had the right to use the land and he also had the obligations laid down by the contract. They were obliged to clear land for cultivation, and they had a limited right to use the forest. They paid a tenant farm tax, which was usually paid in grain. Both houses in Elimyssalo have been forest rangers' dwellings. A forest ranger needed to have many skills and qualities: he had to have "a good reputation and a healthy body, and he had to be of a proper age for the hard work". Literacy and counting skills were also an advantage. The forest ranger took the oath of office and was granted the round forest ranger's badge and a marking axe. 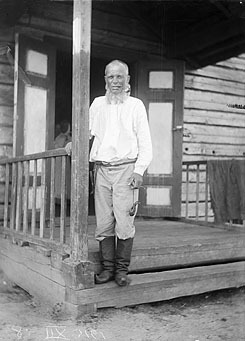 The forest ranger lived in the forest ranger's house, for which he did not need to pay any tenant farm tax. However, the other taxes concerned the forest ranger as well. The forest ranger's fishing and hunting rights were comprehensive, and he was also allowed to take waste wood to be used as firewood. He had to have a permit from the forest officer for taking growing wood and grazing cattle in the forest. Throughout Finland, the lives of peasants who had small farms were based on a livelihood that was obtained from many different sources. A small part of this kind of lifestyle still remains in remote areas of Finland. In Kainuu, slash-and-burn farming continued until the end of the 1800s, although the crops became smaller in size as the area of good slash-and-burn land decreased. Hunting and fishing still formed part of the livelihood in the 1950s and were not just recreation and adventure. Tar burning was a significant source of livelihood in Kainuu and gave security in the years of crop failure. However, in most cases, tar burning was not possible for other than landowners at the end of the 1800s as tar burning was no longer allowed on the State lands. Occasionally, people managed to get some tar burning work from farm owners and received a daily wage. The fields and the cattle produced food for people's own needs. Butter was the only article they sold. They used soft butter mixed with quark for themselves. Salted hard butter was only served at feasts. They had little need for money as they made most objects and clothes for the household. For a long time, salt was almost the only article that was bought with money. The taxes and the payments to the church were chiefly paid in grain or fish. "There is only a terraced wilderness path accompanying you there, taking you a long way from mire to mire, from hill to hill, from house to house. There is not even a terraced path from all houses but only a poor tangled trace that often disappears in heathers and loses its way in the wilds. And that is the only bond between the dwellers of the forest and the inhabited world." That is how Samuli Paulaharju described the former connections to the wilds in his book "Kainuun mailta" in the early 1920s. In the border region, the houses really were located in the trackless wilderness. Elimyssalo could only be reached by horse or on foot until the end of the 1950s. Salt, sugar and flour were carried from the Kotajärvi shop along the footpaths for as much as fifteen kilometres. The children went to school along the same route, and had to cross four lakes. It was only in 1956 that a road was completed from Hamara (Lammasperä) to Juntinvaara. In the same year, a mobile shop started serving the area once a week. Compulsory education came into force in 1921. 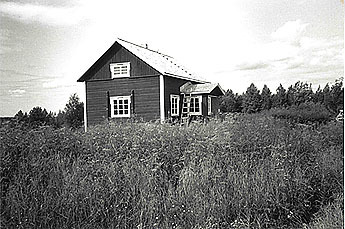 Before that, few of the children living in the houses of the Elimyssalo backwoods went to school, even though there were several schools in Kuhmo. After the issuing of the school district decree in 1898, Kuhmo was divided into ten school districts. There were no schools in every district but children attended the travelling school. When the children from the most remote houses started school, they stayed at residential homes during the school year - the youngest pupils were allowed to visit home three times during the whole year. The small settlements on the wooded hills increased the diversity of wildlife in the area. Many farmyard and meadow species have become established as small islets in middle of the coniferous forest. The accompanying species of culture have arrived at the hill among grain seeds, in people's shoes and in hay for the horses. Only a few species were brought on purpose as there were no ornamental plants in the grounds of poor people's cottages. Today, the farmyards and the nearby meadows are managed as traditional landscapes. They are kept open by mowing. Some increasingly rare meadow species, such as reed canary grass, grow in the Levävaara farmyard. The farms obtained hay from natural meadows, most of which were located along waterways. In former times, mowing brought changes to the meadow species, but the effect has now ceased. The short-term mire cultivation also left slight traces: the mire ditches dug by hand are still visible along the path leading from Levävaara to Lake Elimysjärvi. It is known that the Levävaara farm was inhabited from the 1850s onwards. The house is located on a hilltop, as are many other old houses in the area. 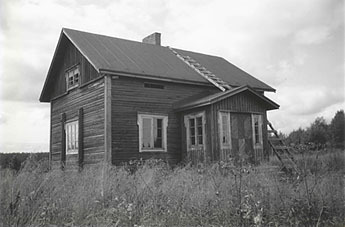 When Tuomas Haverinen moved to Levävaara from Kangasvaara in the 1860s, the house was empty. The former inhabitants, the Komulainen family, had probably gone to Russia in hope of a better life. In his book "Kainuun mailta" Samuli Paulaharju describes how "the Old Man had a gun, a dog, a wife, a pot and three children when he climbed onto the hill". They first lived in a one-window smoke cottage. The tax on Levävaara was determined in 1869. The rent was 16 'kappa' units of grain per year. One 'kappa' is approximately five litres, so the tax was just under one hundred litres. 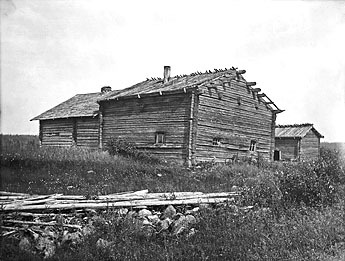 Tuomas made a tenant farm contract with Metsähallitus in 1870. In the contract he committed to clearing about 890 square metres of fields and about 2470 square metres of meadows each year for the next fifteen years. However, the area of the Levävaara fields never exceeded three hectares. Besides farming, hunting was also an important source of livelihood. The end of the 1880s was the most intense period of deer hunting. 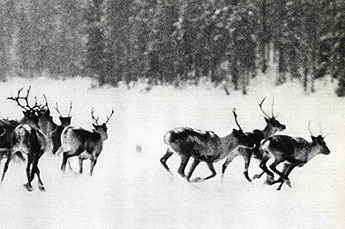 It is possible that hunger may have caused the Haverinen family to move to Levävaara, where there were plenty of deer. In the 1800s, Levävaara was surrounded by broad forest areas. The Crown, i.e. the newly-founded Metsähallitus, hired forest rangers to patrol its vast forest areas. Hard-working men who were used to clearing and hunting met the requirements, so Tuomas was granted the forest ranger's badge and the marking axe in 1887. This position brought Tuomas some advantages and although his district was broad, the guarding job hardly changed his life that much as he would have moved in the forest anyway. The yield of the small fields and meadows was not enough for the Levävaara inhabitants, who were twenty at best. Besides the Haverinen family, Levävaara housed dependent lodgers and at least one maid. When slash-and-burn farming ceased, people started tar burning and working at logging sites in order to obtain additional income. Hunting and fishing were important in helping people to survive. 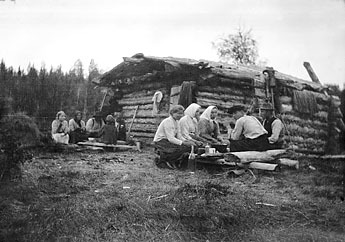 In the bad years, when the crops were killed by the frost, the Levävaara people were able to put deer meat on the table. That helped them to survive the worst times. At the turn of the century Levävaara was a well-off farm in the wilds. Tuomas had built some ten log buildings in the farmyard. The most handsome of the buildings was the twenty-metre long dwelling building, which comprised a large living room, a dining room, a porch and two large rooms. In addition, there was also another building to accommodate logging site masters and guests. Tuomas Haverinen, the Old Man of Levävaara, was the most famous deer hunter in the region. When tracking deer, Tuomas skied here and there in the wilds of the border region. He stayed away on his trips for one or two weeks and had no food with him, just a bag of salt. Tuomas estimated that he had killed about one hundred deer, which is a respectable achievement as it may have taken two or three days to hunt one deer. Tuomas was also a famous bear killer. A lot of magic and customs that had to be carefully followed were connected to hunting. After Tuomas died in 1918, his youngest son Jussi Haverinen became master of Levävaara. At the turn of the century, Jussi had married Mari Korhonen from Viiksimo. A rowan tree was planted in the Levävaara grounds in honour of the daughter-in-law. The forest ranger's post was transferred to Latvavaara in 1912 and Levävaara became a Crown tenant farm again. The contract from the year 1915 determined a tax of 404 litres of grain for Levävaara. In the 1910s, the children of the farm could not yet go to school. In 1931 Levävaara became an independent farm. The executive officials estimated that the farm's meadows could feed ten cows and two horses. The farm had less than three hectares of fields. The start of the Winter War forced the Levävaara inhabitants to leave their home and first escape to houses nearby and then to Ostrobothnia. When they returned, charred remains awaited them; the Finns had burned the buildings in order to prevent the enemy from lodging in them. The Levävaara inhabitants made the old stables into their temporary dwelling. Heikki Kinnunen became master of Levävaara in the 1950s. His wife was Jussi Haverinen's daughter Anna. They got their living from farm work and from logging sites. The field area was increased by mire cultivation but it is not known whether it was successful. Mari's rowan tree, which was planted in Mari's honour, was now called the Grandmother's rowan tree. The milk that was not drunk was separated into cream and skimmed milk. The cream was churned into butter and the extra butter was sold to shops that were located at the ends of the footpaths. The closest shop was 15 kilometres away. Later, they bought a more efficient stationary engine that was used for grinding the grain in the farmyard. Farming at Levävaara ceased in the 1960s and the inhabitants moved away. Thereafter the farm has chiefly been used in the summer time. The farm's lands were sold to the State in 1973. The land was annexed to the Elimyssalo Nature Reserve of the Friendship Park in 1990. The current renovated main building and the cowshed date from the 1950s. A grinding mill has been built after the old model on the shore of the river. One of the paths starting from Levävaara leads to the closest neighbour, Latvavaara. The history of Latvavaara dates back to the 1840s, and it was recorded in the population register for the first time in 1843. Latvavaara was a Crown tenant farm, as was Levävaara. In the very early phase, Latvavaara's crops were grown in slash-and-burn lands, but restrictions were imposed on slash-and-burn farming as early as the 1840s. However, it continued in remote areas for some time. According to the inspection book, barley, rye and turnips were grown at Latvavaara in the area of half a hectare of fields when Johan Pääkkönen was master of the farm. The latter part of the 1800s was a bad time in Finland. Several years of crop failure and epidemics killed a lot of people, tens of per cents of inhabitants in the worst times. Consequently, Latvavaara was also empty for a few decades but then received new inhabitants when Tuomas Haverinen, master of Levävaara, left his post as a forest ranger to his son Matti. Matti settled in Latvavaara. At the time, Levävaara had the right to collect gains from Latvavaara. Together with his wife Eeva he built new buildings on the old dwelling place and raised eight children. Matti's eldest son Juho became master of Latvavaara after Matti. Latvavaara became independent in 1931 when the inhabitants bought the land from the State. At the time, the farm had 1.5 hectares of fields, 12 hectares of meadows for the cattle and 50 hectares of forest. The farm was reasonably small, so much of the livelihood came from forest work as well as from hunting and fishing. 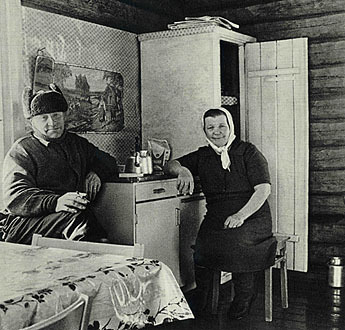 When Juho was killed in the war, his wife Enni married Antti Komulainen and they continued farming. 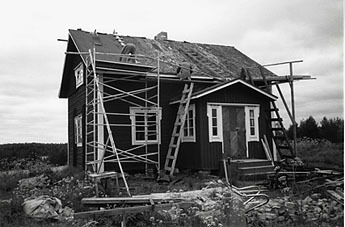 Antti built a new dwelling house in 1955 and renovated the cowshed in the early 1960s. The farm had one more master before it was deserted. Eino Haverinen moved away in the mid-1960s. The forest located within the farm was felled and the land was sold to the State. The beautiful farmyard of Latvavaara, located on the hill slope descending to the lake, became part of the Elimyssalo Nature Reserve in 1990. The meadows in the Latvavaara farmyard will be restored in the same manner as has been done in Levävaara. No changes have been made to the buildings since the farm was abandoned. The buildings are still in a reasonable condition but time has clearly eaten away at them when compared with the renovated main building of Levävaara.